So, a couple months ago I started hearing about Artfields, a 10 day art competition and celebration in Lake City, SC, a town which I knew little about, other than that it’s about 1.5 hrs from Myrtle Beach. 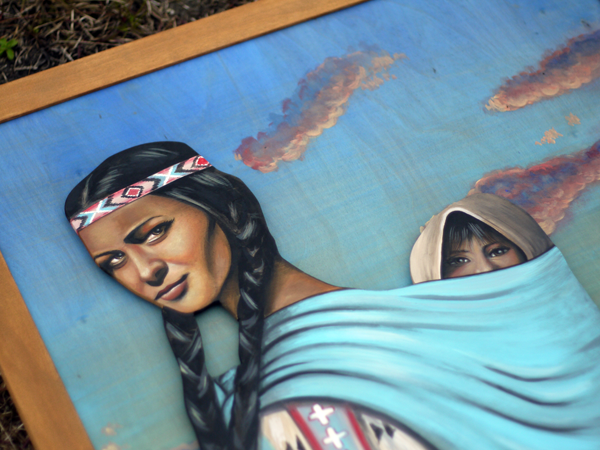 I learned quickly that the organizers of the event were planning on giving away $100,000 in cash prizes and only taking artwork from 400 artists from 12 southeastern states. In the spirit of contest entering (I’ve done quite a few recently) and high hopes of getting chosen as one of the 400, I’m entering…today – the deadline! Like a true artist, I wait ’til the last minute for almost everything, but generally produce my best work that way – it’s funny how that works! Anywho, it’s not like I haven’t been thinking about what I wanted to enter for awhile, but actually executing it was another story. 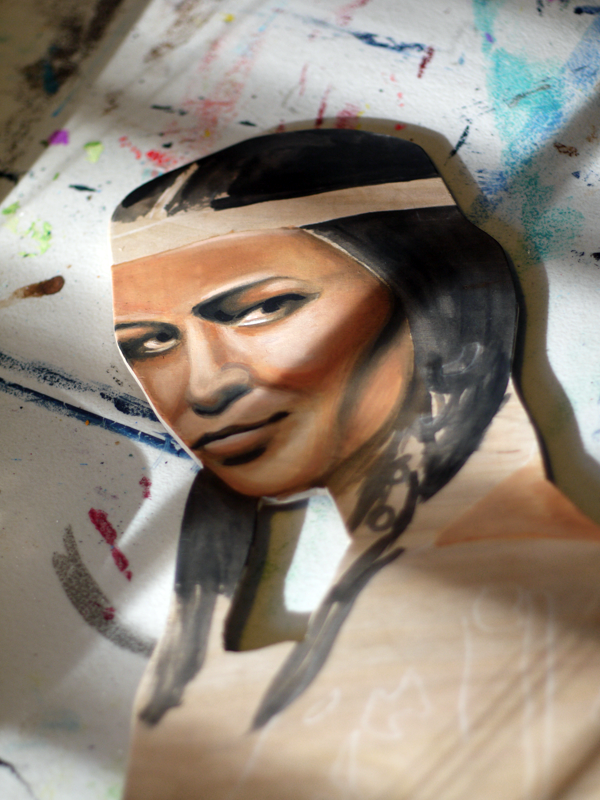 I’m not sure what instigated my initial desire to paint a Native American. I guess something reminded me of my Grammy (Mom’s Mom) who has Cherokee Indian in her blood. 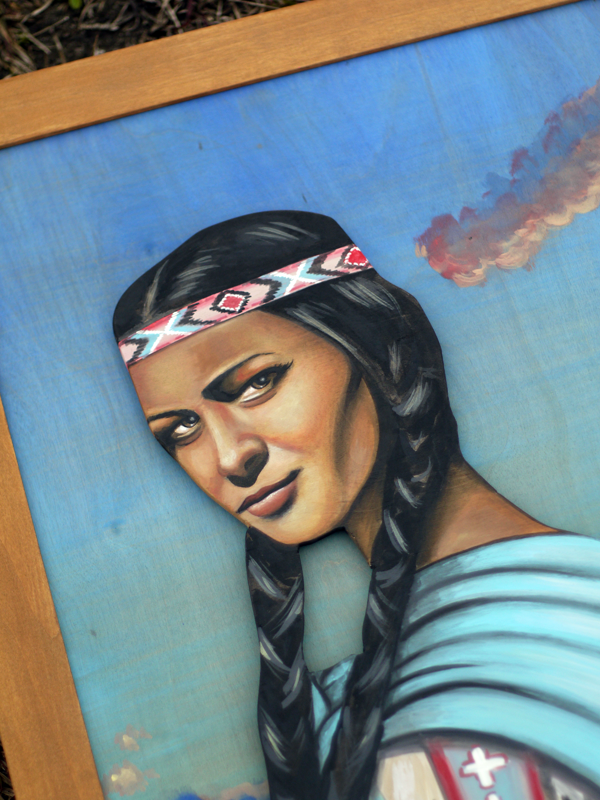 My sister and I have always been proud to tell others of that tiny percentage of Cherokee in us, so I decided to take it a step further and paint a Cherokee woman. Warriors are not what you think of as warriors. The warrior is not someone who fights, because no one has the right to take another life. 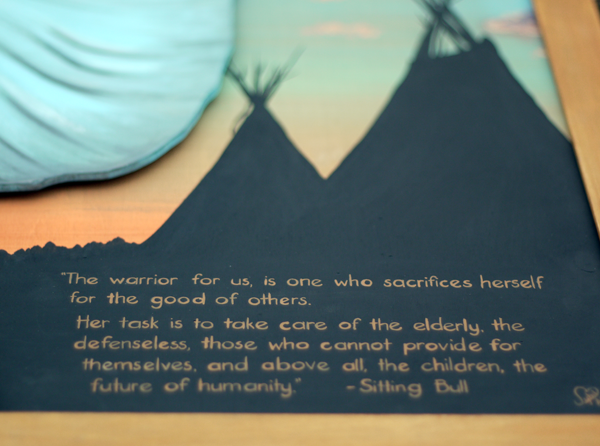 The warrior, for us, is one who sacrifices himself for the good of others. His task is to take care of the elderly, the defenseless, those who cannot provide for themselves, and above all, the children, the future of humanity. After gathering my ideas, I ended up at Lowe’s with my gift card from Christmas to buy a 4’x8′ sheet of birch wood. 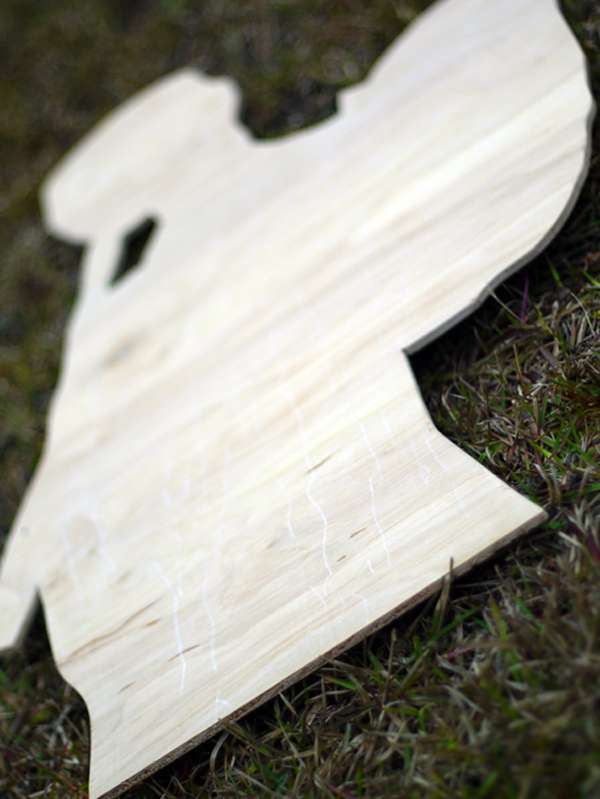 I cut out the woman’s silhouette and a background for her to later be mounted on. Next, I ordered a raw wood frame to tie everything together. I was on my way…but now I had to find time to paint the darn thing! I had a feeling it was gonna be a long process, because I would have a free hour or two here or there, but not a solid block of time…until yesterday! I painted my little heart out and felt a great sense of expression and release, unlike anything I’ve felt in a long time. This piece was from my heart, about something important to me and nobody was telling me to do it a certain way. In the midst of painting the quote (the final step), I started getting emotional. Re-reading the quote made me realize that this was more personal than I thought. It all made sense. 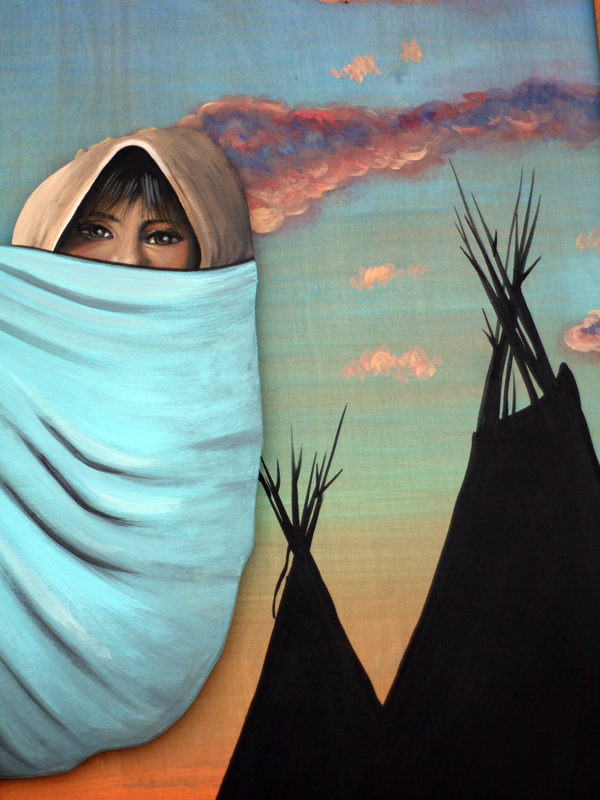 This piece was in honor of all the hard working, unconditionally loving, selfless, strong, courageous, thoughtful, giving women in my life – the warriors. My Mother-in-law, Grandmothers, sister, friends who are new mothers, friends who have a heart for the “elderly, the defenseless, those who cannot provide for themselves”, friends who work with children – deaf, hearing, disabled, all of them, but probably most of all – my Mom. My Mom doesn’t always get the credit she deserves. During any given week you can find her caring for her grandson (my nephew, the cutest baby in the world, Everett), working with the kids at church in an after school program, preparing meals and taking care of her elderly parents, keeping a friend with limes disease company and trying to get her mind off the pain, not to mention, being there for her own children (us) whenever we need her, even if that means staying up late talking through an issue or flying to Myrtle Beach for someone’s 30th birthday (wink, wink). She certainly is one amazing person, as are the rest of the women I know, look up to and respect. Thank you all for being such great examples for the rest of us, I love you! Great work Sybil! 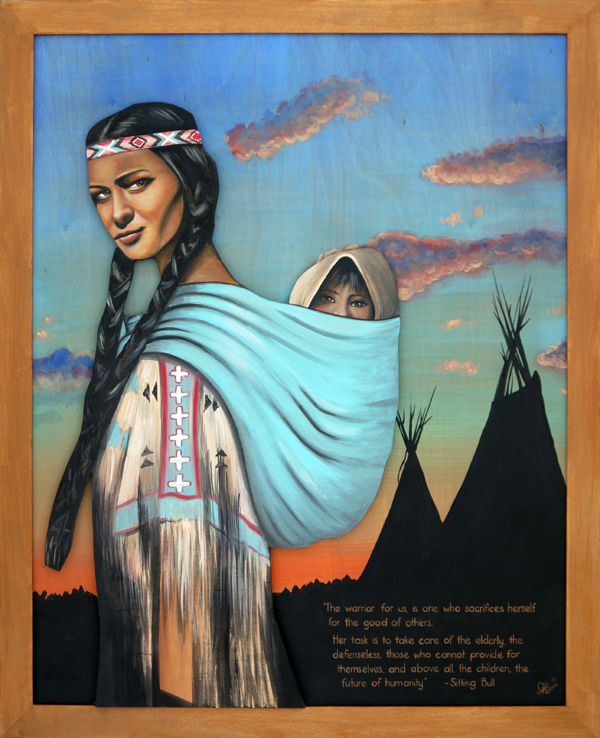 This reminds me of my grandmother who recently passed away – she was a warrior and a strong woman as well. Good Luck!! I love you so much, Warrior!!!!! Allison – I love when people can relate and get something out of my art, it makes it all worth it…your Grandmother sounds amazing! Mom – Didn’t mean to make you cry, but knew it was a possibility, haha! I love you and am so glad you are my “Big Momma”! Lauryn – Love you too, girl! You are and always will be an inspiration to me, thanks for spreading your love and light!